Anne Howard (Chapin) Weston (1913-1992), a native of Hartford, Connecticut, was a student in Rollins College, Winter Park, Florida, from 1930 to 1933. She, and her future husband, Norman Betts Weston (1913-2000), were among the body of students who founded Black Mountain College at Black Mountain, N.C., in the autumn of 1933.The collection consists of one binder with 37 leaves (some blank). The leaves contain pasted color cutouts and some pencil figures demonstrating the application of various color systems studied while a student in a course taught by Josef Albers. Anne Howard (Chapin) Weston (1913-1992), a native of Hartford, Connecticut, was a student in Rollins College, Winter Park, Florida, from 1930 to 1933. She, and her future husband, Norman Betts Weston (1913-2000), were among the body of students who founded Black Mountain College at Black Mountain, N.C., in the autumn of 1933. The collection consists of one binder with 37 leaves (some blank). The leaves contain pasted color cutouts and some pencil figures demonstrating the application of various color systems studied while a student in a course taught by Josef Albers. Anne Howard (Chapin) Weston (1913-1992), a native of Hartford, Connecticut, was a student in Rollins College, Winter Park, Florida, from 1930 to 1933. She, and her future husband, Norman Betts Weston (1913-2000), were among the body of students who withdrew from Rollins College in the spring of 1933 along with John Andrews Rice and other faculty members during a controversy over educational methods. The dissidents then founded Black Mountain College at Black Mountain, N.C., in the autumn of 1933, with the intention of raising to full curricular status the study of the fine arts. The faculty at Black Mountain College was joined at its founding by Josef Albers (1888-1976) who emigrated to the United States in the wake of the closing of the Bauhaus by Nazi authorities in 1933. Mrs. Weston studied drawing under Albers from 1934 to 1936. In the spring of 1937 she took an introductory course taught by Albers on color studies. The course involved research into the different qualities of color when related to form, space, distance, quantity, intensity, and into the effect of color on the psyche. Some lectures in the course were devoted to the color systems of Goethe, Schopenhauer, and Ostwald. [Identification of item], PC.1958, Nan Weston Notebook, State Archives of North Carolina, Western Regional Archives, Asheville, NC, USA. Gift, Carol Weston, San Antonio, TX, 11 Dec 2006. 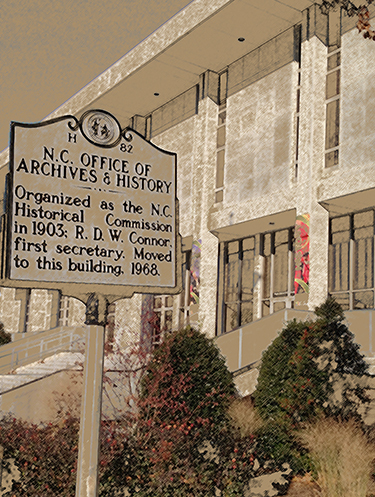 During March-April, 2012, these records were moved from the State Archives building in Raleigh to the Western Regional Archives, Asheville, N.C.
Mrs. Weston's notebook contains pasted color cutouts and some pencil figures demonstrating application of the various color systems studied during the course. Leaves 14, 23, 31, and 33 are devoted to Goethe's system; leaves 16, 17, and 23 to Schopenhauer's system; and leaves 24-30 to Ostwald's system.